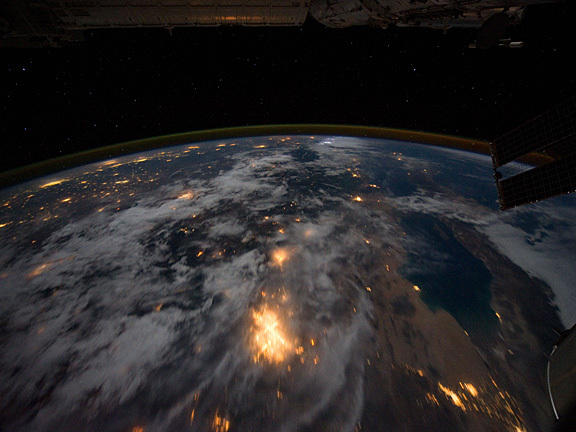 City lights illuminate this night time view of southern California, Mexico's Baja California and the Gulf of Cortez, as photographed by one the Expedition 28 crew members onboard the International Space Station flying at altitude of approximately 220 miles. A 15-mm focal length was used to capture the time lapse image. The thin line of Earth's atmosphere is visible above the horizon. ISS028-E-033315 (19 Aug. 2011) --- high res (1.4 M) low res (65 K)"
\r\n\r\nCity lights illuminate this night time view of southern California, Mexico's Baja California and the Gulf of Cortez, as photographed by one the Expedition 28 crew members onboard the International Space Station flying at altitude of approximately 220 miles. A 15-mm focal length was used to capture the time lapse image. The thin line of Earth's atmosphere is visible above the horizon. ISS028-E-033315 (19 Aug. 2011) --- high res (1.4 M) low res (65 K)\"